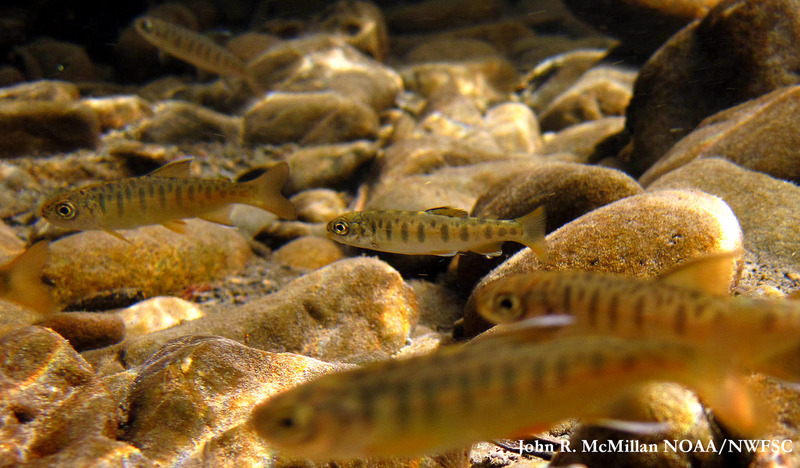 The population size of steelhead (Oncorhynchus mykiss) in Puget Sound has decreased over the past 20 years, with current abundance at less than 4% of historical levels. The numbers are so low that steelhead in Puget Sound were listed as threatened under the Endangered Species Act in 2007. The causes of this decline are not known. It is currently unclear if steelhead are dying as they leave the river, transit through Puget Sound, or while they are in the ocean. However, advances in technology are clearing the way to allow researchers to examine this problem. To determine when and where steelhead are dying, researchers need a way to follow individual fish on their journey from freshwater to the ocean. Electronic acoustic tags have become widely used for tracking many species of fish, but until recently, these tags were too large for steelhead. Now advances in technology have changed the game, with smaller tags that last long enough to provide useful information for scientists. These tags are surgically implanted into steelhead as they swim from the river to the ocean. Each tag is cylinder-shaped and a little larger than a large pill such as a cold capsule. Each has a battery and sends out a uniquely coded high frequency sound (69 or 180 kHz), well above human hearing. In order to detect the tags in the water, researchers put out underwater listening stations (also called receivers) throughout the river, Puget Sound, and the ocean. These listening stations have microphones that can detect tag transmissions from over five football fields away (depending on conditions). When a tagged fish gets within the range of the listening station it decodes the transmission and records the unique identification of the fish and the date and time that it was detected. The listening stations can be deployed in a line, which forms a gate, so that when a tagged fish swims by that location it will be recorded. This is similar to having a Good To Go pass in your car and then crossing the SR-520 toll bridge in Seattle. These gates are set up at specific checkpoints in the system, such as the mouth of a river, narrow portions of Puget Sound such as Admiralty Inlet, and across the Strait of Juan de Fuca (which is the last checkpoint before heading to the Pacific Ocean). 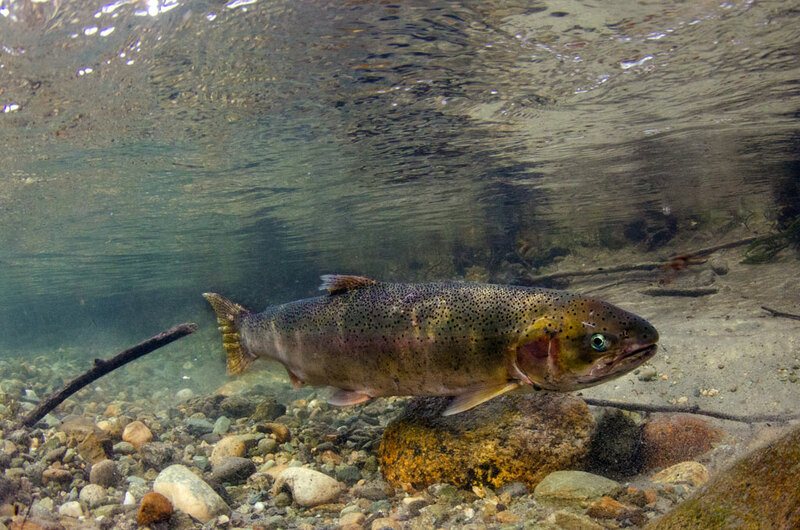 There is no smoking gun for why steelhead populations and survival are currently so low. However, the use of electronic tags is helping researchers narrow in on when and where mortality is occurring. This technology allows researchers to ask questions such as: What percentage of the tagged fish make it to the ocean? Is there a difference in survival between hatchery and wild steelhead? Are there difference in survival among populations from different rivers or points of entry to Puget Sound? A recent study by Goetz et al. 2015 published in Environmental Biology of Fishes asked some of these questions. The authors found that overall survival rates from release to the Strait of Juan de Fuca were low and different between hatchery and wild fish (9.7% for wild and 3.6% for hatchery steelhead). They also found that wild steelhead traveled faster than hatchery fish, with some wild fish swimming the distance of a marathon (25 miles or 41 km) in one day. Another study by Moore et al. 2015 published in Marine Ecology Progress Series found that steelhead survival, although somewhat variable between populations, was relatively high in the river (about 80% of fish survived to the river mouth), but after fish entered Puget Sound the survival was much lower (around 20% of fish survived to the ocean). This suggests that Puget Sound is more dangerous than within the river. What makes Puget Sound so dangerous? A few of the many possibilities include degraded water quality, predation by harbor seals (Phoca vitulina) which have increased in population size rapidly since the 1970s, or predation by birds such as double-crested cormorants (Phalacrocorax auritus), Caspian terns (Hydroprogne caspia) or California gulls (Larus californicus). In contrast to harbor seals, birds that feed on fish have declined in abundance in Puget Sound. A recent study by Berejikian et al. 2016 published in Marine Ecology Progress Series found some evidence of predation by harbor seals. 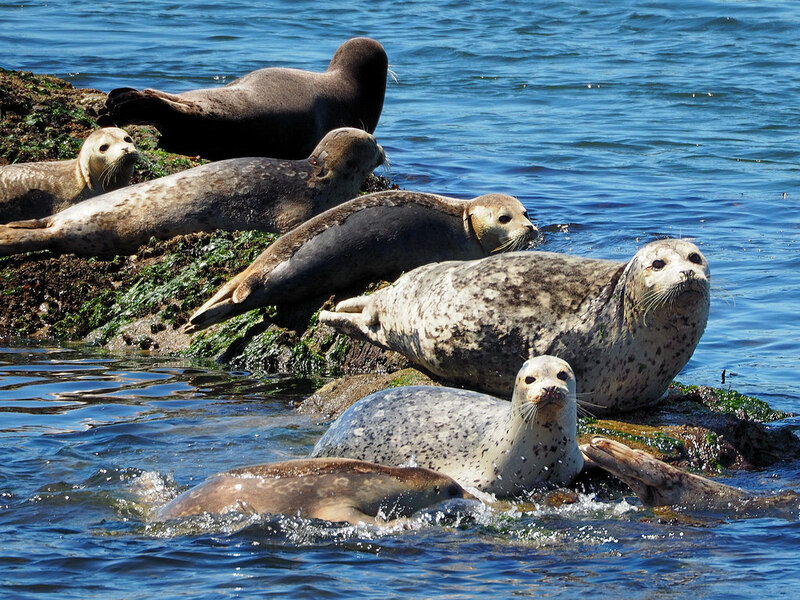 The researchers mounted tag listening devices on the heads of harbor seals. They found that some tags that were inserted into steelhead were consistently detected at known harbor seal haul-out locations by the head mounted listening devices, indicating that those fish were possibly consumed by harbor seals. Advances in other technologies, such as genetic analyses of steelhead populations, have also allowed for the evaluation of restoration efforts. To help restore steelhead populations, managers raise steelhead in hatcheries and release them into rivers with that have especially low numbers of steelhead. The Hamma Hamma River, which flows into Hood Canal, has steelhead populations deemed to be on an “extinction vortex” according to Joy Waltermire from Long Live the Kings, Waltermire gave a talk at the Salish Sea Ecosystem Conference (April 2016) that presented results on some of the initial hatchery supplementation of steelhead in the Hamma Hamma River and other rivers that flow into Hood Canal. She and the team she works with found that hatchery supplementation of steelhead lead to increased number of redds (nests that steelhead dig into gravel where they spawn) compared to control locations. A potential negative effect of hatchery supplementation is that this can alter the genetics of the wild population. Due to the advances in genetic technology, Joy and her team were able to test the genetic diversity of juvenile steelhead caught before and after hatchery supplementation. They found that genetic diversity was not different compared to pre-supplementation. Hatchery effort can help restore populations of steelhead if the factors that lead to low survival have been mitigated. However, if the factors that lead to low survival are still in place then increasing the numbers of fish in the river may be futile.